Already sold out, Colours returns today to Braehead Arena & Waterfront in Glasgow, UK with what many see as the official start to the summer clubbing calendar – Coloursfest! It’s Scotland’s longest running dance event and has been at the forefront of clubbing in Scotland since its launch in 2002. Coloursfest brings together thousands of clubbers and some of clubland’s hottest brands, with a few big name DJs thrown in too. This year’s event is possibly their strongest line-up to date with some of the biggest hitters in dance music at the moment. The Main Arena is hosted by Colours and Weekend Offender and features Showtek and Martin Garrix as headliners along with some great supporting acts. Arena 2 is hosted by Armin van Buuren’s Armada label and features acts such as Markus Schulz, Aly & Fila and Cosmic Gate to name just a few. The Outdoor Stage will once again be hosted by Radio Clyde 1 FM’sGBXperiencewith George Bowie taking centre stage.Arena 4will be hosted byGoodgreef, showcasing some of the finest hard dance talent from the UK and beyond.Arena 5is the place for theIbiza Sessions to shine asJack Eye Jonesand some key Scottish talent get geared up. 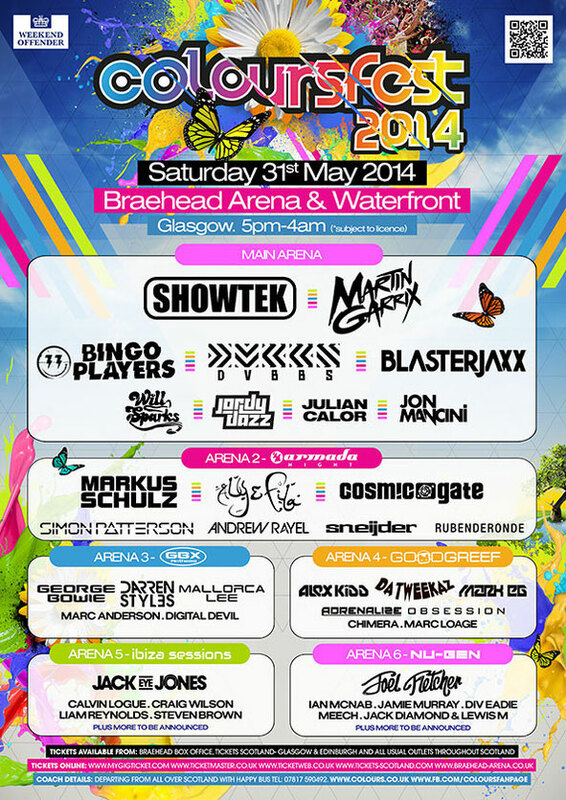 Finally,Arena 6is all aboutNu-Gen, with Joel Fletcher plus some of the best new DJs from across Scotland.